I get asked all the time how I make my lipstick last so long so I thought I would do a little blog post DIY on my ways that I make my lip stick last. Make sure you always wear lip balm, day and night, but make sure that you use the right lip balm for you. Unlike the skin surrounding them, lips have no oil-producing glands to form a protective barrier, leaving them susceptible to sun and wind damage. Licking provides only temporary relief from chapping and eventually contributes to more dryness as the moisture evaporates. Although lip balms provide protection some balms contain ingredients that may cause irritation and chapping. Menthol and camphor are common ingredients in lip balms because they feel cool. However, these ingredients may dry sensitive lips. Look for balms that contain no menthol, camphor, or mint. Lip balms with sun care protection are best for day wear, I would suggest using a lip scrub on a new clean tooth brush before applying lip balm at night time as in the morning, lips will feel soft and smooth. ♡ Start with bare lips: use plain water to wash your lips and pat dry with a clean wash cloth or flannel. ♡ Use a good sun screen lip balm. Even in winter or cold days, always wear sun screen. Your lips need protection too. ♡ Primers are great for lips, and you can get some really good cheap ones if you search around a little bit. Do not use a face primer on your lips, they can take all of the moisture out of your lips and make them really dry and cracked. ♡ Next start with a lip pencil similar to the lip stick you're going to be wearing. Line your lips and then colour them in. ♡ Apply your lip stick. I personally likt to do my bottom lip and then my top lip, but either way will work. ♡ Blush is great to apply over lip stick to help it last longer and also to keep your lip stick in place. Make sure you use a blush that is similar to your lip stick of the day. ♡ Take a piece of tissue and put it over your lips, pat it down with your fingers to make sure it stays in place. Leave for a few seconds and then carefully peal the tissue off. 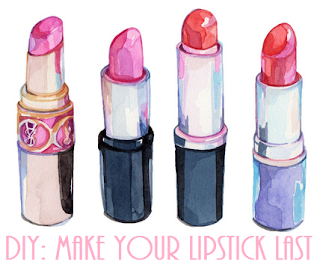 ♡ Re-apply your lip stick just like before, try not to smudge. ♡ Apply one to two coats of your lip gloss and you're done! Tip: Matte finish or satin lip sticks work best for long days. Don't forget you can always take a compact mirror and lip stick or gloss (or both) with you to top up through out the day. I hope these little tips help you in some way, and I hope you're all having a wonderful day!